Are you searching for a midsize sedan that has all of the latest technology features for you to use on a regular basis? If so, visit Landers McLarty Toyota in Fayetteville, TN. At our dealership, we carry an array of new and pre-owned vehicles in stock for drivers to discover including a Certified Pre-Owned Camry. We’re proud to be one of the state’s top-ranked Toyota dealership and will get you our best price on a vehicle. Landers McLarty Toyota has served Huntsville, Columbia and Murfreesboro, TN for a number of years with great prices on vehicles. Stop by our dealership at 2970 Huntsville Highway and explore a Certified Pre-Owned Camry today. Unlike other pre-owned vehicles, a Certified Pre-Owned Camry is backed by an extended warranty and goes through a strict checklist before going on sale. Each Certified Pre-Owned Camry is less than seven model-years old and has less than 85,000-miles on it. For even more protection, every Camry comes with a clean title and a CARFAX Report. After meeting these requirements, each pre-owned Camry goes through a 160-point inspection by our skilled technicians before going on sale. Besides going through a thorough inspection, each Certified Pre-Owned Camry features an extended warranty. Every Certified Pre-Owned Toyota comes with a 12-month/12,000-mile warranty, a 7-yr./100,000-mile limited powertrain warranty, as well as one year of Emergency Roadside Assistance. For even more coverage, you can choose the Certified Gold or Certified Platinum plans that extend your Camry’s coverage. At Landers McLarty Toyota, getting a Certified Pre-Owned or Used Camry is easier than before. We house a gifted staff that will aid you in getting an excellent rate on a vehicle. Even if you have a less than stellar credit score, our staff will work with you to get you an affordable loan. Our available website has a variety of features that will give you an idea what kind of rate you’ll get at our dealership. You can complete an online finance application, payment calculator and a credit score estimator before visiting our dealership. A Used Toyota Camry has the same features that you love from a new vehicle at a more affordable price. Through Toyota’s Certified Pre-Owned Program, you can get into a midsize sedan that has a lengthy warranty. 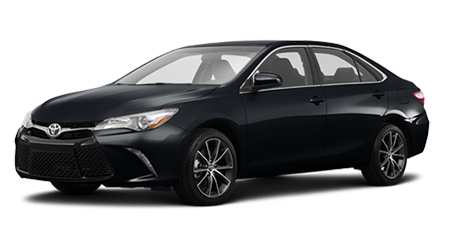 Stop by Landers McLarty Toyota in Fayetteville, TN at 2970 Huntsville Highway and test drive a Used or Certified Pre-Owned Camry today.